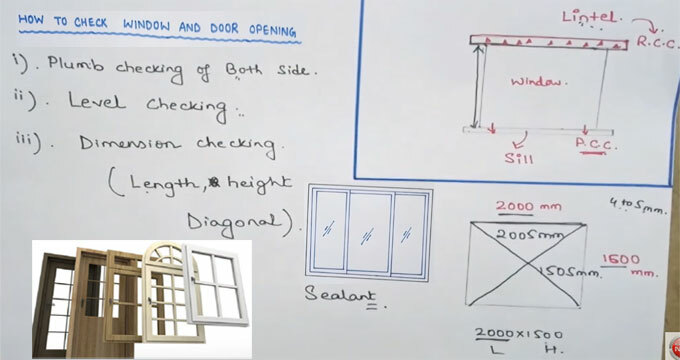 This construction video tutorial from Learning Technology will provide detailed guidelines for examining the openings for doors and windows in construction jobsite. In this video, the width of the sample window is taken as 2000 mm or 2 meter and height is taken as 1500 mm or 1.5 meter. A lintel exists above the window and it is made with reinforced concrete cement or RCC. The window is fixed with sill and it is formed with plain concrete cement or PCC. You have to apply the following methods to ensure that the opening are perfect for windows and doors. Plumb Checking – Plumb Checking should be done for both side of the window to ensure that the both side are vertical. You can use spirit level or plumb for this purpose. Level checking – Level checking should be done with the help of a level pipe for the lintel of the window. Level should be same on all the side of the lintel. Dimension checking – It is done for verifying the exact length, height and diagonal with proper clearance that should be filled up with sealant. You can use a tape for this purpose. It is suggested to provide 4 to 5 mm clearance to both the side of the window.